When my friend Axel Bieringer offered to sell a very unusual Nikon F, I knew it was rare and I would buy it, but I had no idea what it was. Well, I can't prove it, but I am now fairly certain it's a specially modified US Navy Spy Camera! It was made by the famous Lockheed Skunk Works in California, the same guys who made the SR-71 Blackbird super spy plane. In the late 1960's the Skunk Works received a US Navy contract to modify Nikon F's for special reconnaissance requiring accurate measurement of the subject. My source? A friend at Nikon. 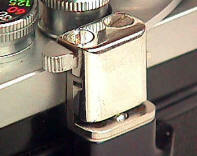 The bodies were modified to keep the film ABSOLUTELY flat with a special locking film pressure plate. The lenses were specially calibrated to determine the EXACT focal length. This combination, combined with the exact distance of the subject, allows precise measurements of the subject photographed. This is not a unique idea. 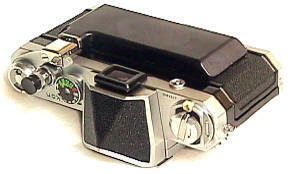 Rollei fans may be familiar with the specially modified Rollei 35 made for making exact measurements photographically, the Rollei "Metric." What would the Navy photograph? Well, how about those Russian "fishing trawlers" off the US coast in the late 60's that were loaded down with radar gear? 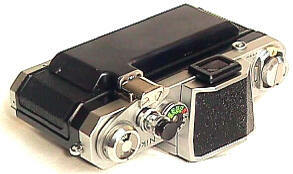 With this camera, it was easy to determine the exact sizes of the radar antennas and so guess its capabilities. How did the Skunk Works do it? A special large pressure plate presses down and locks the film flat!! That hump on the back of the camera hides the pressure plate. The plate presses the film flat when the advance lever is locked in place, and then pulls back when the film is advanced. Advancing the film unlocks the plate and allows the film to move through to the next exposure! 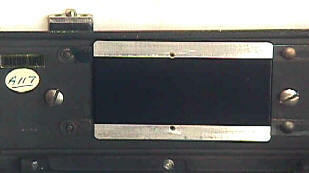 The film gate rails were also modified, so the new pressure plate could push the film completely flat. 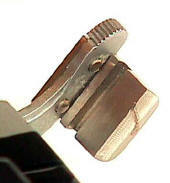 On the left is the advance lever locked into place, film pressed flat. On the right is the little spring loaded ball when automatically comes up and releases the pressure plate when the shutter is advanced. 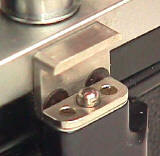 These shots show the extension on the advance lever which pushes down the ball, which locks the film. 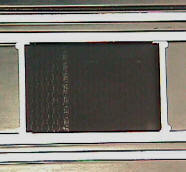 Close-up of pressure plate and film gate, machines for flatter film. This is a CameraQuest first. 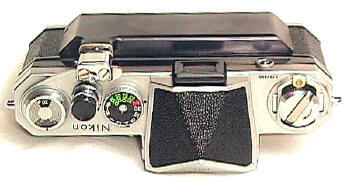 This may be the first time the Nikon F Spy Camera has been written about outside of classified military documents. You will certainly find it in no other Nikon collector's guide. Production is unknown, but it was probably very low, in the tens of cameras. It's official military designation is unknown, but calling it a Spy Camera sounds a lot more interesting than a Trawler Camera! Many thanks to Axel Bieringer.